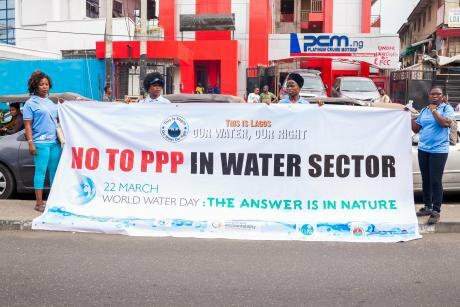 Water, water everywhere, and not a drop to drink: how the Environmental Rights Action group campaigned against water privatisation in Lagos. Demonstrators at a World Water Day rally in Ikeja, Lagos, in March 2018. Credit: Environmental Rights Action. Ajayi had to raise her voice to be heard over the din of maintenance work going on outside the building where she was meeting with other water rights campaigners brought together by Environmental Rights Action (ERA) Nigeria. The anti-water privatisation activist lives in Adebari-Ilobu, a high-density suburb in Lagos with limited access to public services. Although it is only a few minutes’ drive from one of the water treatment and processing plants, it has never been connected to the grid. Ajayi and several others engaged in efforts to prevent the privatisation of water supply in Lagos State gathered together to lay out the problem. According to A. K. Edema, a regional manager and union member at the Lagos State Water Corporation (LSWC), the gap between demand and supply is immense. “In my almost seven years of living there, I don’t think we’ve experienced any government water." Ajayi’s neighbourhood slots into the second category: the second phase of water distribution where communal solutions have been the only recourse. A borehole donated in the early 2000s by a member of the Lagos State House of Assembly was the community’s main source of water until it stopped functioning in 2016. After its collapse, private citizens started to sink their own boreholes; depending on the topography, this can cost between N150,000 and N300,000 (approximately 417 to 834 USD). These days, Ajayi and her neighbours mostly buy water from those who can afford this investment. Unfortunately for Ajayi and other Lagosians, the model that the Lagos State government is pursuing for water provision operates on profit and loss. And this caught ERA’s attention. The 25-year-old non-governmental organisation and the Nigerian chapter of Friends of the Earth International created the campaign ‘Our Water Our Right’ to counter the trend. 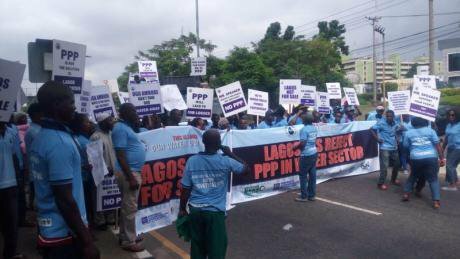 Demonstrators at a World Water Day rally in Ikeja, Lagos. March 2018. Credit: Environmental Rights Action Nigeria. It is ironic that Lagos State, a coastal city named for its many inland waterways, has a water problem. The growing metropolis has a demand of close to 600 million gallons a day (MGD), but the LSWC produces less than half of that. Citizens bear the brunt of this inadequacy, with the poorest being the hardest hit. For example, one 20 litre keg of water used to be worth N20 before the fuel price hike in 2016; by the end of that same year, the unit price hovered in the N50-N70 range. In many neighbourhoods, families of 6 spend more than N1500 every day on water. Government-led efforts to privatise the state’s under-resourced and under-performing water supply services began to take shape with the creation of the Lagos Water Law in 2004, which touted private investment in the water sector as the only solution. In 2014, ERA discovered that the state government was about to enter into a partnership with the International Finance Corporation (IFC) – the arm of the World Bank which operates to maximise profit – to privatise the Lagos water supply. Led by the Executive Director of ERA, Akinbode Oluwafemi, and two staff members, Philip Jakpor and Veronica Ivoke, the team began their investigations in a bid to uncover evidence. Once ERA had this information, they began efforts to resist the move. Their reasons were multiple: the government’s historical inability to be accountable for loans taken from the World Bank; the billions of dollars already spent to boost water supply in Lagos with no tangible results; and the corruption and scandals which have mired privatisation efforts across the state. 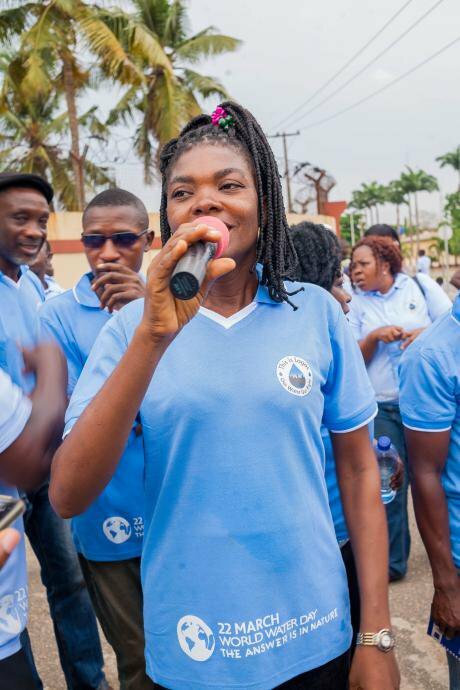 Veronica Ivoke, the coordinating officer of AWWASHNET, at a water rally in Lagos. Credit: Environmental Rights Action.The ‘Our Water Our Right’ campaign kicked off in October 2014. From the onset, ERA was determined to partner with local and international civil society organisations, communities and trade unions within the water sector. "If the campaign is not owned by the people, our goal will not be achieved." To better structure community participation and sustain civic engagement across various communities, ERA instituted water parliaments where ideas and alternative solutions could be debated. A network of women within the movement also created the African Women Water Sanitation and Hygiene Network (AWWASHNET). Coordinated by ERA staffer Veronica Ivoke, AWWASHNET was born out of the recognition that women are most impacted by water problems. “Who washes clothes or cooks food? Who has to trek and trek to fetch water from wherever?” asked Ajayi, one of AWWASHNET’s early members. The campaign also reached out to the Amalgamated Union of Public Corporations, Civil Service, Technical and Recreational Services Employees (AUPCTRE), which is affiliated with the Nigerian Labour Congress. AUPCTRE, the largest union in the LSWC, represents about 75% of all unionised workers within the agency. AUPCTRE’s leadership recognised their twofold interest in ensuring that water supply remains in the public domain: as government workers, privatisation puts their jobs at risk, and, as tax payers, they deserve accountability from their government. “The government tried to undermine us by going to other factions and assuring them of job security if they agreed to the privatisation effort,” said Comrade Biodun Bakare, the State Secretary for AUPCTRE’s Lagos State Council. Many protesting workers were laid off after a 2016 rally. ERA stepped in to petition the LSWC and demand the reinstatement of those who had lost their jobs. Within a week, their letters of termination were invalidated. In Nigeria, given the prevailing feeling of powerlessness in the face of a government that is often self-serving and rarely averse to abuses of power, the ability of the ‘Our Water Our Right’ campaign to produce results is even more remarkable. When Shayo Holloway, the then-head of the LSWC who had presided over hundreds of millions of dollars of investment into the water sector with no results, was forced to resign, the campaign knew they had won their first victory. 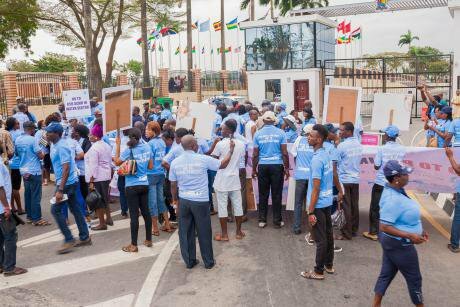 Water rights demonstration outside a Lagos State Government agency, March 2018. Credit: Environmental Rights Action.Subsequently, the government allocated about USD185 million to the water sector, despite previous claims that there were no available public funds. By 2016, the IFC was forced to pull out of the proposed partnership with Lagos State due to local and international scrutiny and pressure. This loss of potential funding slowed down the government but didn’t stop them. Not long after the IFC pulled out, campaign leaders discovered that the Lagos State Environmental Bill had begun to quietly move through the State House. This proposed Environmental Bill was an attempt to legislate various forms of public utility privatisation, including water provision. It contained clauses that criminalised any kind of citizen efforts to secure water, including things as simple as transporting water from one house to another. What we need is affordable, accessible, and democratically accountable water provision. [...] After all, is water not a human right? Despite that, Oluwafemi still made it to the hearing. Following his intervention, ERA and their partners at AUPCTRE kept a close watch on the legislators, corresponding and meeting with them. “They had to expunge the parts of the bill that criminalised how people source water,” Oluwafemi said, satisfied. The document highlights the failures of the current water system and proposes a comprehensive strategy for collaborative, citizen-directed, publicly funded water supply. This includes the Water Trust, which analysed the water usage rates of large corporations like Coca Cola as a framework for a water tax. Bolstered by the successes of their campaign, the ERA-led coalitaon continues to defend the rights of those few Lagosians who currently enjoy state-supplied water and to strive to keep the government accountable. What lessons can we learn from these particular projects? Have you been involved in something similar that you could tell us about? Do you know someone who has? Do please join us in comments space below, and help us build and network the knowledge.